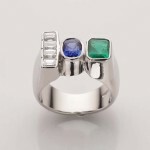 A very fine quality Trilogy POWER Ring with Em Cut Fine Quality Diamonds, Em Cut Fine Emerald & Cushion Cut Blue Sapphire all set in Platinum. This is a very uniquely design customised ring for natives with lagna Taurus, Libra, Capricorn & Aquarius towards enhancement of their health, stability, vision, imagination, defence from any crisis, flow of income, wealth, assets, savings, power in your speech, presentation, recognition, appreciation, common sense, wisdom, choices & decision making strategy, birth of a child, rise in luck, prosperity, rising, power, status, prestige, honour, establishments, peace of mind, properties, comforts, success, achievements & awards. This is especially appropriate if your business deals with properties, liquor, petrol, oils, steel, scrap yards, machinery, building, constructions, sales purchase of business assets & precious stones & mining.